3. Select the Flash® movie you want to add in your screensaver. 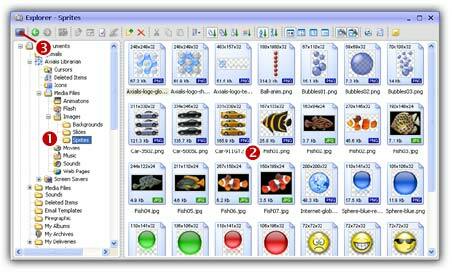 You can select several files by clicking on files while pressing on the CTRL key. To select a range of files, use the SHIFT key. 5. A dialog box opens. Select Flash® Based Screen Saver option in the list. Click Next. 7. The screensaver project window opens with the Flash® file selected. Now specify the screensaver display properties. To learn more about Flash® screensavers, we recommend you to follow this tutorial. 8. We can take a look at the result full screen. Press F11 or click the Full Screen button in the toolbar. The screensaver is executed full screen. Press a key or move the mouse to end the full screen test.